With the start of summer I am always looking for recipes for good salads. My criteria is something that is somewhat healthy, tasty and of course looks good. 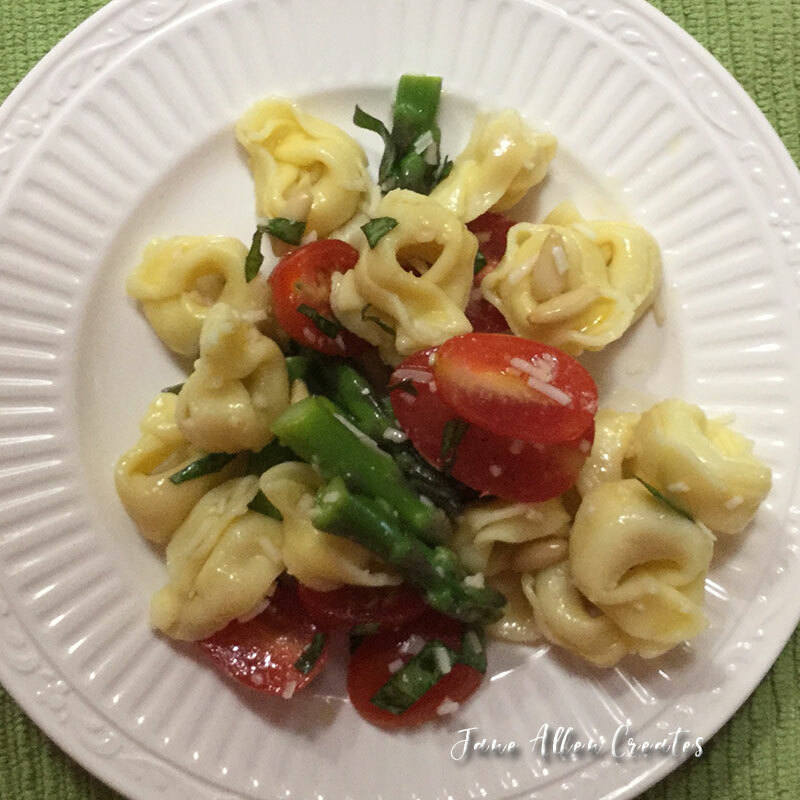 I found this Tortellini Salad with Asparagus and Fresh Basil Vinaigrette in “America’s Test Kitchen – Make -Ahead Cookbook”. I took it to my cousins for Mother’s day and it was a big hit. It was so good I made it again this weekend. 3 Tablespoons lemon juice, plus extra for seasoning. To get started you will want to trim the asparagus and then cut into 1″ lengths. While you are doing this bring 4 quarts water to boil in large pot. Fill a large bowl half way with ice and water. Add asparagus and 1 Tablespoon salt to boiling water and cook until crisp-tender, about two minutes. Using slotted spoon, transfer asparagus to ice water and let cool, about 2 minutes. Drain and pat dry. Return pot of water to boil. Add tortellini and cook, stirring often, until tender. Drain tortellini, rinse with cold water, and drain again, leaving tortellini slightly wet. Whisk lemon juice, shallot, garlic, 1 teaspoon salt and ¾ teaspoon pepper together in large bowl. Whisking constantly, drizzle in oil. Add tortellini and toss to combine. Add asparagus, tomatoes, Parmesan, basil, and pine nuts and gently toss to combine. Season with salt, pepper, and extra lemon juice to taste. Serve. Enjoy your holiday weekend as we remember all those who sacrificed for our freedom. This looks so delicious and would be great for our church potlucks! Thank you for sharing, Jane! You are welcome Effie, I hope you enjoy it!